Preheat your oven to 350°F and grease a 9×13″ pan with canola oil spray. In a stand mixer, blend butter and brown sugar. Add in baking powder, salt, vanilla, eggs and cream them. Mix in the flour and then fold in white chocolate chips and walnuts. Smooth blondie mixture into pan with a spatula and bake 350°F for 30-45 minutes. I find these to be tricky to bake as the outsides start to brown while the inside is still very loose. However, cook until the middle is cooked, check often near the end! 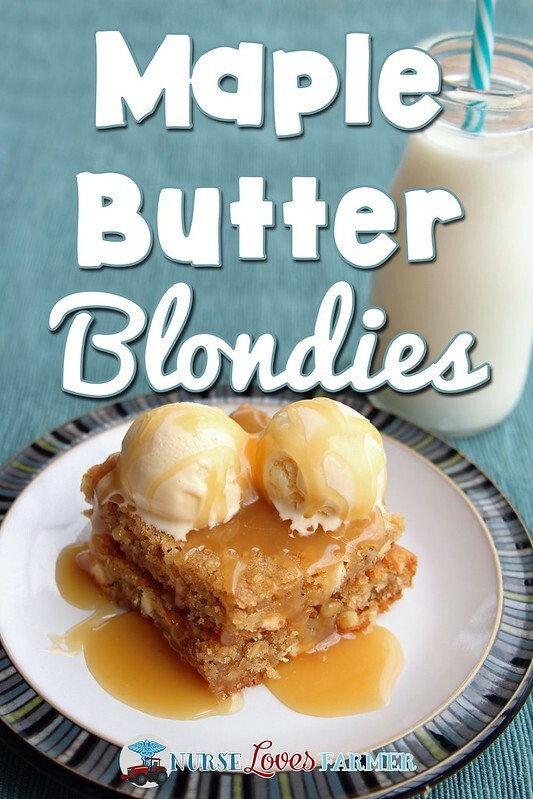 Once the blondies are cooled enough to eat, you can make your sauce by combining first the sugar, whipping cream and butter in a sauce pan and bringing to a boil. Cook for 2-3 minutes, remove from heat and add the maple flavoring. While the blondies are still warm, cut them into whatever portion size you want, top with scoop(s) of vanilla ice cream and drizzle with sauce. They are very rich but the ice cream helps to ‘neutralize’ the sweetness! 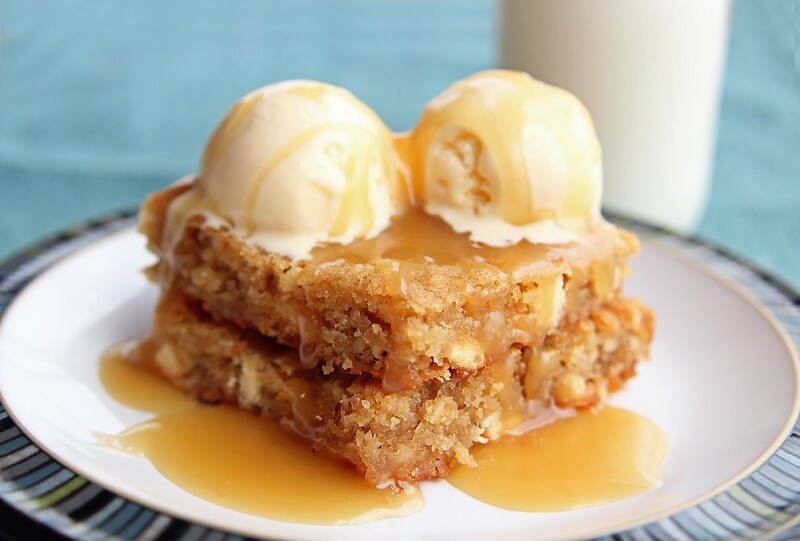 Chewy, soft, nutty, warm blondies topped with vanilla ice cream and a warm maple butter sauce. Preheat your oven to 350°F and grease a 9x13" pan with canola oil spray. In a stand mixer, blend butter and brown sugar. Then add in baking powder, salt, vanilla, eggs and cream them together. Mix in the flour and then fold in white chocolate chips and walnuts. Smooth blondie mixture into pan with a spatula and bake 350°F for 30-45 minutes. I find these to be tricky to bake as the outsides start to brown while the inside is still very loose. However, bake until the middle is cooked, check often near the end! Make your sauce by combining first the sugar, whipping cream and butter in a sauce pan and bringing to a boil. Cook for 2-3 minutes, remove from heat and add the maple flavoring. While the blondies are still warm, cut them into whatever portion size you want, top with scoop(s) of vanilla ice cream and drizzle with sauce. They are very rich but the ice cream helps to 'neutralize' the sweetness! Thanks for the feedback, glad you liked! I'm so glad you researched blonde brownies…they are some of my favorites!!! Love the yummy maple sauce drizzled over these! They sound awesome!